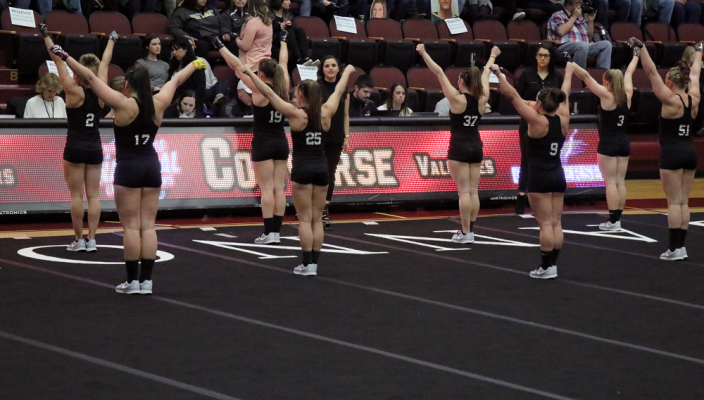 For the first time in program existence, Gannon University hosted the 2018 National Collegiate Acrobatics and Tumbling Association (NCATA) Championships in the Hammermill Center April 26-28, and the event received high marks all the way around. The host Knights, seeded No. 5, came back after a 276.140 – 265.525 loss to No. 4 University of Oregon on April 26 to win gold in the Inversion Pyramid Event two days later. Dan Teliski, Gannon’s assistant director of athletics and media relations, did not have exact numbers on attendance but he estimated 1,500 people attended Gannon’s meet with Oregon. He estimated that 1,000 people came the next two nights. According to Mark Jeanneret of the Erie Sports Commission, the economic impact to the Erie community was nearly twice as high as the commission anticipated. “We projected the economic impact of the NCATA Championships conservatively at $500,000 but that was based primarily on the teams that qualified for the event because we have the numbers to support the estimation,” Jeanneret said. “We didn’t factor family and friends into the calculation because that was an unknown. Despite the loss April 26 to Oregon, the Knights qualified for the championship round in Inversion Pyramid, Open Pyramid, Open Toss and Trio Tumbling events Saturday. The Baylor Bears took home their fourth NCATA Championship, defeating Quinnipiac University, 283.360-274.650. Prior to the championship round the Bears defeated Converse College in the quarterfinals and Oregon in the semifinals. Quinnipiac defeated Azusa Pacific University, 275.450-274.105, after coming back from a halftime deficit in the quarterfinals. Among those claiming gold was Gannon’s Inversion Pyramid group, which included junior Lisa Wagaman, who received the Louise Goodrum Academic Achievement Award for her 3.97 GPA as a Knight. Senior Chelsea Cowan was also in the group and received All-American honors. Sophomores Brittney McNiff, Ashley Barrish, Nikki Pizzi and Jocelyn Scott were part of the group along with freshmen Danielle Samuel and Zeina Ellamei, juniors Sydney Pouliopoulos, and Sarah Guarriello, and seniors Elizabeth Martin and Hayley Nejman. Coach Jacquie Eshleman said she is happy with her athletes and the Gannon and Erie communities that came out to support them. “You could feel all the energy from our fans and it really kept our athletes in a good place, especially with some questionable scoring,” she said. “In every sport there are always penalties and calls made by referees that you don’t agree with and can at times affect the athletes’ mindset. Senior Michaela Soper said it was great for the team members to have their last meet on their home turf. Especially with it being a national championship. Eshleman said as a whole she is incredibly proud of her athletes. “We always compete for us, and try to maintain focus on that,” she said. “It is all we can control. We can’t control our opponents or scores, only our skills and actions.